The world has changed. With the introduction of Coil technology, the earth has found itself in possession of a limitless energy supply taken from a newly discovered fourth dimension: Dimension W. With this new power source the New Tesla Corporation has been able to resolve Earth’s energy problems, and has created a monopoly in the distribution of the coils that harness Dimension W’s energy. When illegal coil collector Kyouma Mabuchi ends up partnered to sentient robot Mira Yurizaki, the two find themselves embroiled in a greater conspiracy revolving around the true nature of Dimension W. Does this series unlock its true potential? Or does it get lost in a void of possibilities? The biggest praise I can give this series is that it starts off with an admittedly very interesting premise, and has a lot cool ideas for the world. The introduction of coils has led to a technological revolution. Robots and energised prosthetics are now commonplace, with the average citizens living in relative peace and security. There’s a lot of intriguing minutia squirreled into this series, like how the World System of Coils interacted with international politics, and New Tesla has to keep up their public perception as the sole legal distributor of the world’s main energy supply. There’s really a fully functioning world here to discover and explore made even more mysterious by the cryptic Dimension W.
Dimension W is a good looking show, It has a sense of style and design that really makes this technological future seem vibrant and alive. This doesn’t feel like a bleak technological dystopia, nor like “our current world” just with holograms, but rather there’s a fun futuristic sense here more reminiscent of Cowboy Bebop than anything else. Not to say there aren’t some downsides to the artwork of this series, sometimes the direction seems a little less than opportune (for the most prominent example just watch Kyouma dancing during the Opening Credits, such an awkward looking scene which is framed too close to his body, and seems somewhat out of character for him). But these small things never detracted at all from my enjoyment of the series, and the action scenes look really nice to boot, so there’s something definitely to like in the art department. I’ll be honest, when I first came to the series, I didn’t feel much about the main characters, Kyouma and Mira, one way or the other. Kyouma was a stoic-coil distrusting ninja and Mira was cute robot doing things cutely. It wasn’t bad, but nothing remarkable. The interesting characters by far were some of the side characters. Loser, his partner, the African princes, they were all cool and had far more interesting quirks then the leads especially at first. I will admit however that when I rewatched the first few episodes in Dub (which is excellent from what I heard of it) I really gelled with the mains a whole lot more. Maybe it was the fact they didn’t feel so “stereotypically” cast in English, but that could just be me. Further along in the series though the show delves further into Kyouma’s past and it is at that point that his character becomes more interesting, however at this point we are also introduced to a whole handful of characters for the Easter Island arc who are designed more out of style than substance. They’re not terrible, but the cast starts feeling a whole lot more disposable and inconsequential at that point - outside of the few previously introduced characters. One of the biggest issues, perhaps, to those coming into this series, is the shift that happens about halfway through the series. The first few episodes of Dimension W sell the show as a Cowboy Bebop-esque adventure of capers with the small jobs of a couple of coil bounty hunters, that play into the surrounding world of coils and the social/political/economic progress around them. Instead of that though, the show changes direction halfway through turning into a character drama/ shonen action-race (during the easter island arc) where the world building is discarded and delayed for character arc stories that just don’t hold up to all the promises the first couple episodes made. Coupled with the shows awkward change in direction halfway through, is an unfortunate hurdle where the show manages to make its own premise seem patently absurd and ridiculous by its own narrative incompetence. During the course of the series a number of seeming impossible marvels that are strange, even to the cast, start showing up as impeding roadblocks to the story. However since Dimension W’s true nature is revealed so slowly, and the show tries to keep up the “mystery” of the world intact by either hand waving stuff away or just saying “Dimension W did it” the whole conceit of Dimension W starts feeling like a magical macguffin the writer do whatever with, instead of an actual part of their world. One such example of this failure of narrative is particularly noticeable when the show introduces these two blue orbs at the beginning of the Easter Island Arc. Now the world we are presented with is one of technology and not magic, however over the course of 3 or 4 episodes the sense we get from these orbs is that they are sentient orbs that hate men, and make people collapse when touched. However there’s no real reason for almost any of this until finally the show reveals to be the product of a mad scientist behind everything at the end. But by that point in the series I had already lost any connection to this series, as my suspended disbelief had had already been broken by that point. (Man hating mystical orbs? Really?) And it’s this same attitude of hiding the “reveal” till later that just killed off any meaningful tension or feeling of consistency in the series. The king of all this delayed gratification, and pseudoscientific magic is of course the titular Dimension W itself. 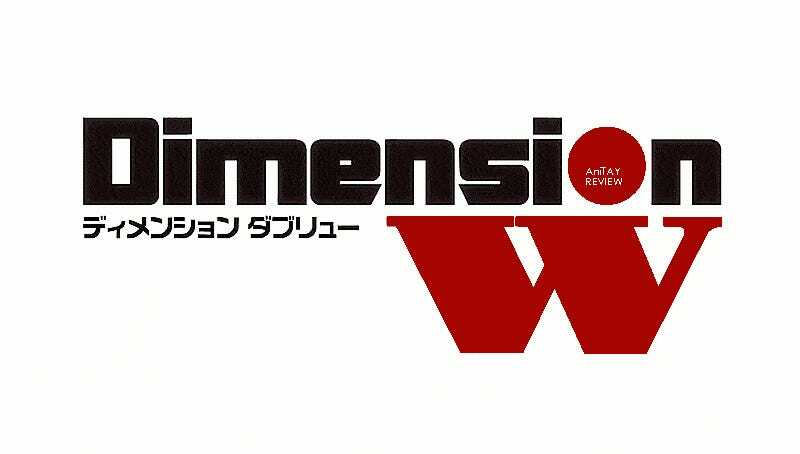 As I said above, the show starts with Dimension W as simply a source of energy, but by the end I think the show was so preoccupied in both explaining Dimension W and in tearing apart both our and the character’s perceptions of what Dimension W is, that the show failed in making the rest of the story more coherent and interesting which is really the biggest failing of all. I was surprised when I looked back at those first few episodes again after seeing where they ended up, and the overwhelming sense you get is that Dimension W wastes its potential on a plotline that bites off more than it can chew, diving too deep into its own metaphysics instead of just selling us this world. This show has a Lot of ideas. A LOT. And many of them are cool and at least interesting, however the brevity with which these issues are handled simply doesn’t allow for any of the really cool ideas to shine, and are instead thrown into the messy chef’s salad with a bunch of pseudo-science technobabble dressing that just ends up being a mess on the plate. Stuff like The african princes’ backstory arc, or the pasts of Kyouma and Mira are all interesting in their own right, but I would have preferred them more if they weren’t just garnishes to a lackluster main dish. This series could have made an amazing sci-fi anthology, and what we get instead is really just the disappointment of wasted potential. I hate to do this, but I can’t honestly recommend this series the majority of those watching this show for the story. This show is just too crammed with ideas, themes and hand-wavy pseudo-science to make it worth the trip. It would be easy to call it trash, but even so, to me it was eminently watchable trash all the way through. The designs, the world and some of the ideas are all really cool, but its story just fails to deliver. It’s not a bad show, I just have severe issues telling people to watch it, because there’s other shows out there that will fill the Dimension W hole in your heart, and you should probably just watch one of those instead. Dimension W was a Winter 2016 show by Studio 3Hz, directed by Kanta Kamei, and based off the manga by Yuji Iwahara. It was released by Funimation Entertainment, in both sub and English dub. *Moviebob’s original quote had nothing to do with shows, but rather the moral character of Spiderman, i just wanted to acknowledge his brilliant sentence structuring.